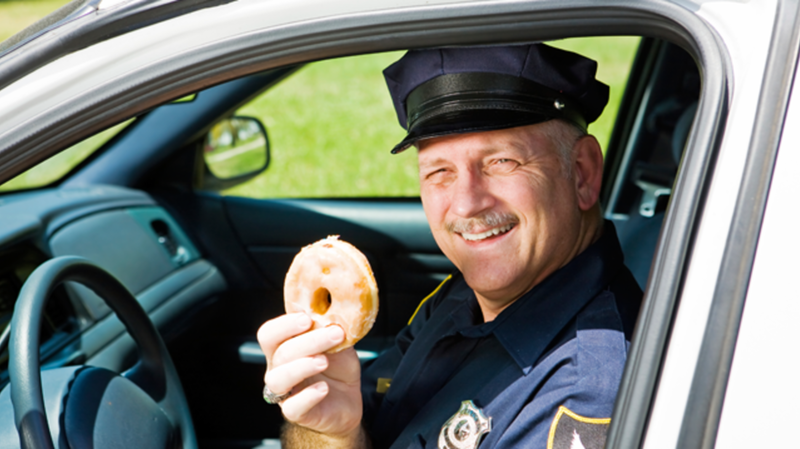 Where Does That Stereotype About Cops and Doughnuts Come From? In a clichéd depiction of a police officer, he's just as likely to be holding a doughnut as he is a gun or a pair of handcuffs. The trope—that cops love the greasy pastry—is tired. But is it true? And how, exactly, did law enforcement officers become known for this supposed affinity for anything glazed, sprinkled, and frosted? Over at Atlas Obscura, writer Cara Giaimo delves into the doughy lore, tracing the unflattering cliché’s origins back to the mid-20th century. During this time, Giaimo writes, police departments started covering their beats by car instead of by foot. During the graveyard shift, doughnut shops were convenient late-night spots to fill out paperwork, drink coffee, park a cruiser, and make an emergency phone call. A reciprocal relationship was born. The doughnut shops felt protected with the police on their premises, and officers enjoyed having a place to refuel. Some small-town doughnut shops kept special desks for police officers. Other kitchens developed such strong alliances with local law enforcement that top officers warned cops against accepting the sweet treats for fear they’d appear biased. Soon, cops became synonymous with doughnuts—and popular culture immortalized the relationship. However, the relationship between doughnuts and our country’s servicemen goes far deeper than the modern-day cop cliché, Giaimo points out. In World War I, Salvation Army volunteers served doughnuts to the soldiers on the front lines in France. In the 1920s, the Red Cross provided free doughnuts for veterans who were living abroad. In fact, the tradition of serving doughnuts to America's protective forces can be traced all the way back to a New York Times article from 1898, in which volunteer cooks served a group of soldiers a batch of the homemade pastries. This simple gesture of care might have stuck with relief organizations over the years, and perhaps helped gave rise to the contemporary cop-doughnut stereotype that we laugh about today. In any case, the hackneyed caricature has a sweet origin story—no matter which way you swallow it.